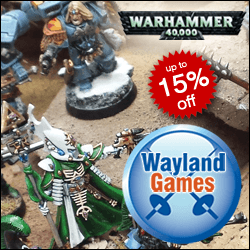 This was first featured on Space Wolves Blog which is now lost to the warp. In an effort to retain the information we have republished the article by David Richardson here. Hello once again fellow Space Wolves enthusiasts! 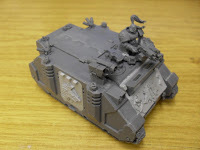 It’s time for me to discuss my approach to Games Workshop plastic vehicles kits for the Space Wolves. 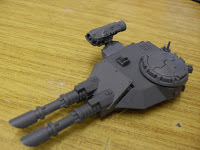 in this article I will be showing you how to fully magnetize a Predator tank so you can use all the options available to it from the plastic kit. I personally like to have some flexibility in my models, and by that I like to be able to equip them with all or none of the extra option as the need arises in my army list. 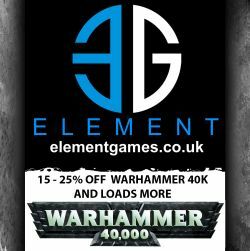 After all you have just spent your hard earned cash on a model why not get the most from it too! 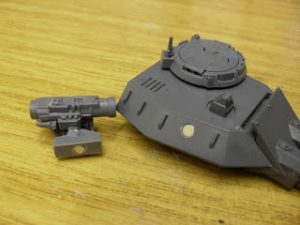 I follow the instruction in the box for assembly but the one thing I don’t do is glue the roof of the tank on til last, I also complete all the magnetizing on each side of the Chassis before I assemble the tank, this is important because it can be very fiddly to work on the tank as a complete item. 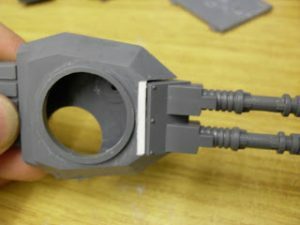 After gluing the Lascannon and Auto cannon barrels together I remove the tags on either side and mark the center so i can drill the hole for the magnets, I glue a magnet on each side making sure the magnets are the same way round for both turrets. The next job is to glue a magnet in either side of the turret so that the barrels will click into place, I had to widen the original holes here to take the magnets and its very tricky so test fit them a few times before gluing. I also use some glue to secure the magnets inside the barrels at the back. Whilst we are on the turret I glue a strip of plasticard underneath the turret to stop the barrels from drooping (no one like s a droopy gun now do we!) 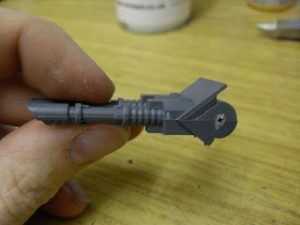 and I also attach the Hunterkiller missile to the turret with magnets like so. 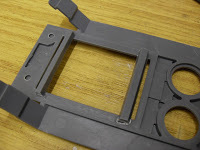 The next step is to magnetize the sides of the chassis, to do this I glue the two halves of the sides together and fix a magnet to the middle of the inner door. 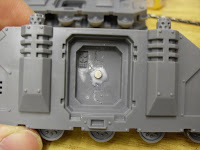 Then I glue a piece of sprue to the inside of the door, and I drop a second magnet onto the inner door magnet and place a small blob of glue on the back of the magnet and put the door into place and leave for a minute or two. Once dry the door is removable and has the magnet stuck in the correct place to line up. 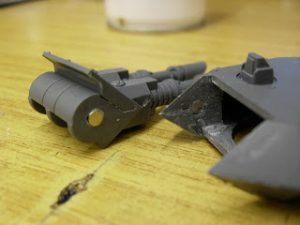 I also use this technique to fix the predator side sponsons into position before I assemble them. 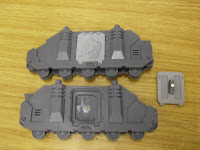 The next part is the roof of the tank, this magnetised to take the Rhino door type roof and the turret ring for Predator/ Razorback/ Whirlwind turrets. To do this I glue two strips of plastic sprue across the roof on the inside making sure they don’t interfere with the sides being glued on or the rear door, once again test fit every bit before gluing it together. I also glue magnets to the two roof panels in corresponding locations these magnets may need to be recessed into the roof panels and the sprue a little bit to fit properly (be careful not to drill in too far, I do this by hand to be safe that in not going to go through the other side). 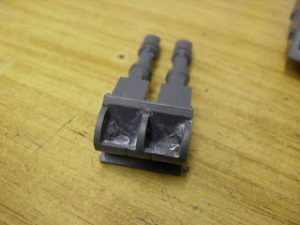 To do this is use the drill bits to enlarge a hole that the magnet can sit in some of the magnets can be made to sit flush or below the surface and filled over so they are not visible this a personal preference really. The next part is probably the hardest and most time consuming its sponson time! 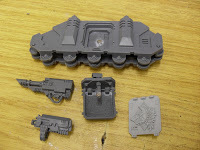 The first part is to modify the Lascannon and Heavy Bolter to take magnets and the central support. 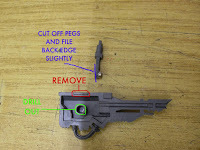 Drill out both peg holes on the weapons and remove the pegs off the support, Glue a magnet to the support and file away the back a little this allows it to slide into place inside the weapons once they are glued. 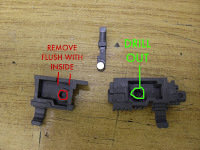 Fix magnets into the drilled out holes in the weapons and remove the plastic in the red areas and test fit the support is should slide into place through the hole in the top of each gun and should unclip too! do all this before gluing the two halves of each gun together it helps iron out any mistakes believe me (the magnets may need a little extra glue to hold them steady). You will then be left with something like this for each side. And voila! 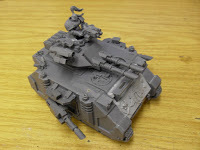 the fully magnetized Predator, you can use this technique on Razorbacks and whirlwinds too if you like to have all the option available. 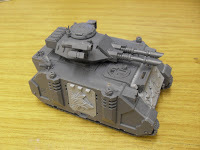 This tank will be used as a Rhino, Lascannon Razorback and Predator in my army lists as the need arises and the good thing is I only need 1 tank to do all three! I hope you liked this article and if you have any questions feel free to ask away.